SPACEPORT NEWS October 1, 1999 Page 2 Technology ...(Continued from Page 1)privately in his garage. Having worked with wind sensors since 1975, he was certain that the conventional devices of the day could be improved upon. Zyskos pursuit eventually gained the interest of officials from the National Oceanic and Atmospheric Administration (NOAA), which noted that no reliable, landbased measurements of wind speeds were made during Hurricane Andrew in 1992. All known sensors in the hurricanes path of maximum wind had been destroyed. NOAA requested the development of a sensor that could withstand winds from hurricanes and tornadoes of up to 300 miles per hour. The project also suited a particular need at KSC, where such a sensor would allow engineering assessments of buildings, ground support equipment and flight hardware in the wake of a hurricane or tornado. Funding came from the Center Directors Discretionary Fund in 1997, and Zyskos office began work in collaboration with a contractor, Dynacs Engineering Co., Inc. In 1998, the team developed the first of three generations of prototype units featuring a 3-inch metal rod as the sensing element. The sensor measures the aerodynamic force imparted to the rod, which is comparable to the force on a pencil held in someones hand commercial, such partnerships strengthen the centers position for the future. The essence of research and technology development at KSC involves fast-response problemsolving and design techniques, as well as more long-term endeavors geared toward critical operations technology. KSCs most recent report on research and technology includes 81 separate projects in differing stages of development. These projects share a common DNA, arising from Kennedys function as the NASA Center of Excellence for Launch and Payload Processing. Within that framework resides a great variety of pursuits, covering such areas as life sciences, mechanical engineering, environmental engineering, advanced software, atmospheric science, materials science, nondestructive evaluation, process and industrial engineering, automation and robotics and electronics and instrumentation. In the first of a series of articles on technology development, here is a look at some projects being pursued at KSC. Hurricane Wind Sensor It began in 1990 as a prototype that Jan Zysko of the Technology Development office crafted outside the window of a moving car. The sensor is superior to existing technology because it has no moving parts. Conventional wind sensors use either propellers or rotating cups, which can break and whose bearings can wear out. The older sensors also are subject to the effects of inertia, which can skew readings. Zysko said the current version is accurate up to 150 mph as tested in a wind tunnel at Embry Riddle Aeronautical University in Daytona Beach, and higher speed testing on the unit will continue at Langley Research Center. The engineers considered setting up the unit at KSC during the recent approach of Hurricane Floyd, but time constraints and uncertainty about the storms path made the plans impractical. Zysko said there is a possibility of having a unit ready for field deployment before the end of the current hurricane season. Even though the next phase of the project development of a mounting device remains a challenge, the diminutive sensor already has become something of a lightning rod for industry. KSC has started the process of securing a patent. A couple of companies are interested in licensing the technology. It has great commercial potential, Zysko said. NOAA has indicated they would dearly love to have 100 of these to put out in anticipating a hurricane. Advanced Life Support Automated Remote Manipulator This project resulted from the Advanced Life Support offices need for an improved means ofKSCs remote manipulator system helps scientists gather valuable data without disturbing controlled environments. (See ALSARM, Page 3) monitoring the plants growing in controlled environments. The Automated Ground Support Systems Laboratory responded with a device that gives scientists precise measurements without disrupting the conditions in its experimental chamber. As part of the Biomass Production Chamber breadboard project, KSC transformed an Apollo-era altitude chamber into a facility in which crops such as potatoes and wheat can be grown. The chamber, known as the Controlled Ecological Life Support System (or CELSS), is part of experiments designed to help NASA understand how to grow crops in space for moon or Mars bases. The Advanced Life Support Automated Remote Manipulator (ALSARM) grew out of a flaw in the experiment: When technicians entered the chamber to take environmental measurements, their presence disturbed the carefully controlled conditions. In addition to the leak effect caused by the opening of the chamber door, the technicians brought carbon dioxide and organic products into the chamber. ALSARM, a joint effort of KSC and the University of Central Florida (UCF), addresses those problems by using a completelyThe current version of the hurricane wind sensor is accurate up to 150 mph, as tested in a wind tunnel at Embry Riddle Aeronautical University in Daytona Beach. KSC has started the process of securing a patent. SPACEPORT NEWSPage 3 October 1, 1999 Cards with these customer care tips will be distributed to all NASA employees at KSC in conjunction with the national Customer Service week in October.Keeping customers satisfied at KSC NASA recently announced the winners of its 1999 Minority Business awards. The winners of the three top awards are: Minority Contractor of the Year: Dynacs Corp., Bal Harbour, Fla.; Minority Subcontractor of the Year: Information Dynamics Inc., McLean, Va.; and Women-Owned Business of the Year: Dynamac Corp., Rockville, Md. Nominated by Kennedy Space Center, Dynacs Corp. provides technical support for research, development and engineering projects in the Space Shuttle program. Dynacs is one of the most prolific producers of innovations at NASA, having developed 58 new technologies since 1998. This feat put Kennedy Space Center second among NASA centers in patent applications. Dynacs Corp., which also won in 1997, is the first company to win the Minority Contractor of the Year award twice. Information Dynamics Inc. (now InDyne, Inc.), a subcontractor at NASA Headquarters, Washington, D.C., supports the information technology requirements for NASAs offices of Earth Science and Space Science. The company develops computer applications, focusing on Internet-based and client-server applications. Because of the companys work, the White House and the U.S. Congress have recognized both offices Web sites. Dynamac Corp., also nominated by the Kennedy Space Center, is the first back-to-back recipient of the Women-Owned Business of the Year Award. Dynamac provides technical expertise for NASAs biological research, environmental monitoring, life science flight experiments, biomedical operations and occupational-health programs. During a recognition ceremony on Sept. 21 at NASA Headquarters, NASA also presented Jackson & Tull Chartered Engineers, Greenbelt, Md., and Rush Construction, Tallahassee, Fla., with the Agencys Special Recognition Award for their support and accomplishments. Five of NASAs field centers and several NASA employees were recognized for their outstanding contributions and innovative approaches to using minority and women-owned businesses. In addition, David Ortiz, procurement center representative with the U.S. Small Business Administration, was presented with a Special Recognition Award for using a NASA initiative to match a minority business with a multimillion-dollar, multi-year award at another federal agency. For more information and a full list of winners, visit the NASA Office of Small and Disadvantaged Business Web site at http://www.hq.nasa.gov/ office/codek/Minority Business Awards announced Satisfying customers needs is what KSC employees strive to do every day, but an even greater emphasis will be given to that goal during October. A number of special activities are planned at Kennedy Space Center to educate employees and increase awareness of just what great customer service means. The timing is right, since October is Quality Month, and Oct. 4-8 is National Customer Service Week. Federal budget cuts and increased competition from launch sites across the world have caused managers and workers at Kennedy Space Center to begin rethinking the way KSC deals with customers. KSC has come a long way in recognizing who our customers are, the importance of those relationships, and the necessity to build strong partnerships through topnotch customer service, said Linda Buckles, customer advocacy manager in the Business Innovation Group. We are government, but we are not immune to comparisons that our customers make about our launch services, she continued. In fact, as a premier launch site we are often expected to offer more than the others. One of the highlights of the week will be a discussion of customer relations given by Michael Bonsignore, Honeywells chief executive officer. The program will be held on Oct. 8, at 10:30 a.m. in the Training Auditorium. Honeywell has not only focused on customers needs, but, in their own terms, they have made the customer the center of the universe. Bonsignore offers valuable insight for KSC in building customer focus systems, Buckles said. All KSC employees are encouraged to attend the Oct. 8 program in order to learn more about maintaining and building customer relationships. With customer expectations in mind, and as our emphasis shifts towards development via the Spaceport Technology Center, KSC will be offering our services not only to our current customers, but to new customers as well, Buckles said. Given the comparisons that are being made and the reputation that we must maintain, we are forced to understand these new customers goals and to customize our services to respond. We need to measure the level of customer satisfaction with our services, and improve areas that are not meeting our customers needs. That is one of the primary goals of the KSC Customer Advocacy Team. According to Deputy Director for Launch and Payload Processing Loren Shriver: KSC will need to continue our close coordination in partnerships with current and new customers to insure we are provid-ALSARM ...(Continued from Page 2)automated robotic sensor system to monitor the growth chambers. Now fully installed in the facility at Hangar L, ALSARM gives biologists a non-intrusive means of measuring luminescence, temperature in various locations, wind speed and direction and relative humidity and other factors. The instrumentation part is finished, said Bill Jones of the Automated Ground Support Systems Laboratory. Now were looking at putting in an end-effector that would actually pick the plants and put them in an air lock. That project is ongoing, and right now its being worked with UCF and NASA/KSC. ing needed products and services as we evolve to the Spaceport Technology Center of our vision. 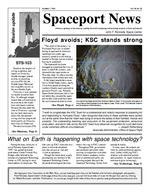 Page 5 SPACEPORT NEWS October 1, 1999 At Cape Canaveral Air Station's Complex 5/6, a Redstone rocket (above) lies broken on the pad after Hurricane Floyd passed along the East Coast of Florida, Sept. 14-15. Still standing behind it are the Explorer I (center) and Jupiter C (right) rockets. The complex, now dismantled, was the site of the first manned launch May 5, 1961. At a weather tower located between Shuttle Launch Pad 39A and Launch Complex 41, the highest winds recorded during the superstorm were 91 mph from the NNW at 4:50 a.m. on Wednesday, Sept. 15. The maximum sustained winds were recorded at 66 mph. The highest amount of rain recorded at KSC was 2.82 inches as the eye of Hurricane Floyd passed 121 miles east of Cape Canaveral at 4 a.m. Wednesday. The east side of the Vehicle Assembly Building (below) shows missing panels around the leaves of the upper door, the effect of the high winds from Hurricane Floyd. There appeared to be no major damage to NASA assets, including the launch pads, the four Space Shuttle orbiters and flight hardware.greatest national treaures are our employees. Bridges added that KSC will reassess its performance from Floyd with an eye to improving the robustness of its facilities and procedures to weather such potent hurricanes in the future. During Hurricane Floyds approach, NASA officials had expressed concern that Floyds fiercest winds could wreak significant damage on the hangars housing the Agencys orbiters. Three of the orbiters were parked in the Orbiter Processing Facilities, built to withstand 105 mph winds, while Atlantis was in the 525foot-high Vehicle Assembly Building, designed to handle 125 mph winds. Other payload and flight hardware support facilities can endure winds of 110 mph. The highest wind recorded at the space center was 91 mph at 4:50 a.m. on Sept. 18. An assessment later that day showed that most of the storm damage was institutional in nature. The east side of theVehicle Assembly Building (VAB) shows missing panels around the leaves of the upper door the effect of the high winds and some VAB siding panels are blown off of the east and west sides of the building; however, there was no structural damage. Blowing rain caused some water intrusion underneath hangar doors at the Orbiter Processing Facility high bays, the doors of the adjacent main engine maintenance facility, and the north door of the VAB transfer aisle. There is minor damage at Pad 39-B from damage to the weather protection that encloses the primary pad electrical system. Various antenna systems around KSC also received light to moderate damage, all of which is repairable. There was roof damage, which caused some leakage, to the Canister Rotation Facility. As a result, repairs to the electrical and mechanical equipment within the facility are necessary. In the interim, the payload canisters will be rotated in the VAB. A railroad spur running alongside Launch Pad 39A and 39B is covered with debris washed up by Hurricane Floyd. Numerous signs were blown over, some trees are felled and two traffic lights were fully down. Four rockets with a total value of $825 million remained secured to their launch pads at Cape Canaveral Air Station, adjacent to Kennedy Space Center. Two NASA facilities in Virginia Wallops Flight Facility and Langley Research Center were closed Thursday as Floyd passed through. I salute the NASA employees for their preparedness and responsiveness during the threat of Hurricane Floyd, said Goldin. My deepest appreciation goes to the 105 volunteers at KSC who rode out the storm. The willingness of the NASA team to protect our nations assets is the hallmark of what makes us great. Although the damage turned out to be minor, Floyd ranked among the closest calls with bad weather ever experienced at the Kennedy Space Center. Goldin told CNN that God has been good to us. We look like we dodged a bullet. He added that Floyds close call rang a warning bell. In a special message to NASA employees, Goldin stated that the President, the Vice President and the Federal Emergency Management Administration Administrator each called me to convey their concern. The President particularly expressed his commitment to preserving and protecting the space assets of our country.Just east of Kennedy Space Center's Launch Complex 39, Pads A & B (Pad 39B is seen upper left), sea-oatcovered sand dunes along the Atlantic Ocean show the effect of wind and high water from Hurricane Floyd. SPACEPORT NEWSOctober 1, 1999 Page 6 Above, a mockingbird perches on a limb in the Merritt Island National Wildlife Refuge. Mockingbirds are very vocal, often imitating the sounds of other birds. Besides providing a winter home for mockingbirds, the refuge provides wintering areas for 23 species of migratory waterfowl, as well as a year-round home for great blue herons, great egrets, wood storks, cormorants, brown pelicans and other species of birds. The 92,000-acre refuge is also habitat for more than 331 species of birds, 31 mammals, 117 fishes and 65 amphibians and reptiles. A black-necked stilt waits near its nesting mate nest in the Merritt Island National Wildlife Refuge, which shares a boundary with Kennedy Space Center. Stilts usually produce three or four brown-spotted buff eggs in a shallow depression lined with grass or shell fragments. In the nesting season they are particularly agressive. Stilts are identified by a distinct head pattern of black and white, very long red legs, and straight, very thin bill. Their habitat is salt marshes and shallow coastal bays from Delaware and northern South America in the East, and freshwater marshes from Oregon and Saskatchewan to the Gulf Coast. At left, an alligator lurks in the murky, mossy waters of the Merritt Island National Wildlife Refuge at Kennedy Space Center. Its tail surfaces behind him, looking like a log in the water. The wildlife refuge harbors nearly 5,000 American alligators, some of which can be seen in the canals and ponds around KSC. The open water provides wintering areas for 23 species of migratory waterfowl and a year-round home for great blue herons, great egrets, wood storks, cormorants, brown pelicans and other species of marsh and shore birds.Celebrate wild things at Merritt Island National Wildlife Refuge On Saturday, Oct. 16, the Merritt Island National Wildlife Refuge will sponsor live animal exhibits, educational activities for children, a free fishing clinic, free kayak tours, special wildlife and habitat demonstrations along with special discover your refuge tours. The goal of the day-long free celebration will be to raise awareness, appreciation and understanding of the values of Merritt Island National Wildlife Refuge. We hope that all residents will consider this an open invitation to come learn about and enjoy our rich wildlife resources that are found on our national wildlife refuges, said Ron Hight, refuge manager at Merritt Island National Wildlife Refuge. Live animal exhibits will be showcased at the refuges Visitor Information Center from 11 a.m. to 3 p.m. They will include live raptors and a bald eagle from the Audobon Center for Birds of Prey; live native Florida wildlife, such as a gopher tortoise and snakes, a live alligator and a crocodile from the Florida Fish and Wildlife Conservation Commission; and a living aquarium exhibit from the Department of Environmental Protection. Also at the Visitor Information Center, KSCs Dynamac Corporation will exhibit special wildlife technology demonstrations, and the Native Plant Society will offer native plants for sale. Children visiting the center will have a special opportunity to build birdhouses and feeders and get their faces painted. Highlighting the days events will be a self-guided discover your refuge tour, where participants following a designated route will discover many species of wildlife, including eagles, scrub jays and manatees. Also along the route, stops will include demonstrations on songbird mistnetting and banding, live fish seining in the salt marsh, waterfowl and wading bird identification, and invasive plant species, among others. At each stop, participants will get their tour map stamped and obtain information on different species of wildlife and habitat and learn how they can help to protect them. Each participant who completes the tour will receive a bag filled with goodies from the refuge. Additional activities for the event include a free youth fishing clinic at the refuge fishing pond from 9 a.m. to 3 p.m. conducted by the Space Coast Sportfishing Foundation. The fishing clinic will give hands-on experience and education on fishing, including casting, knot tying and baiting. Bait will be provided, but a limited number of fishing rods will be available, so participants are encouraged to bring their own. Osprey Outfitters will offer free kayak tours from the northwest corner of Haulover Canal in the Indian River Lagoon. The kayak tours will be offered at 9 a.m., 11 a.m. and 1 p.m. and will be limited to 28 persons on each trip. The Save the Manatee Club will hold a membership drive at the refuges Manatee Observation Deck and will be available for visitors to answer questions and provide educational information about how people can help protect manatees. Canaveral National Seashore will hold a special program from 10 to 11:30 a.m. on Oct. 16 at Eddy Creek Pavilion as part of the Wild Things Celebration. Sea Turtle Adventure will explore the different species of sea turtles, how they nest and what is affecting their survival. If a nest is available, the group will have the opportunity to excavate it to check for baby sea turtles. With this and other events on wildlife refuges across the country, the Fish and Wildlife Service announces the fifth annual National Wildlife Refuge Week Celebration from Oct. 10-16. For more information, call the Merritt Island National Wildlife Refuge at (407) 861-0667. The event will be coordinated from the refuges Visitor Information Center, located four miles east of US 1 on State Road 402 in Titusville. John F. Kennedy Space Center Managing editor. . . . . . . . . . . . . . . . . Bruce Buckingham Editor. . . . . . . . . . . . . . . . . . . . . . . Susan Maurer Editorial support provided by InDyne, Inc. Writers Group. NASA at KSC is on the Internet at http://www.ksc.nasa.gov USGPO: 733-112/80041Spaceport News Spaceport News is an official publication of the Kennedy Space Center and is published on alternate Fridays by the Public Affairs Office in the interest of KSC civil service and contractor employees. Contributions are welcome and should be submitted two weeks before publication to the Media Services Branch, AB-F1. E-mail submissions can be sent to Susan.Maurer-1@ksc.nasa.gov SPACEPORT NEWSOctober 1, 1999 Page 8 KSC Director Roy Bridges (right) makes his Combined Federal Campaign (CFC) contribution on-line at http://cfc99.ksc.nasa.gov, while Ed Markowski, training coordinator for Shuttle Processing and CFC member, looks on. Today marks the kickoff of KSCs annual Combined Federal Campaign (CFC) the time for all civil service employees to reach out and support less fortunate people in the local community, our nation and throughout the world. The kickoff rally was scheduled to occur today in the Training Auditorium. Information concerning the campaign can be found on the KSC CFC Website at http://cfc99.ksc. nasa.gov/ This website, which can be used by all employees to make their contribution, is now active. This year, a drawing from the names of all contributors will be held each week during the campaign, so the earlier in the campaign that an employee makes a contribution, the more opportunity he or she will have to be selected for one of the excellent prizes. A grand prize will also be awarded at the conclusion of the campaign. Prizes are expected to include gift certificates to the NASA Exchange; KSC Visitor Complex Tours, including IMAX Movies and KSC Bus Tours; as well as passes to local area theme parks. In the spirit of this years campaign slogan Those who care, share Center Director Roy Bridges said, Lets join together and show that we at NASA KSC are those who care and that we share!KSCs 1999 Combined Federal Campaign kicks off today Mars Climate Orbiter missing in action NASAs first interplanetary weather satellite failed to reestablish contact with Earth after it entered Martian orbit. Mission managers stated that it probably broke up in the upper Martian atmosphere. They said the Climate Orbiter apparently came in too low and did not survive the maneuver. After a nine-month cruise from Earth, the spacecraft fired its main engine as scheduled on Sept. 23, and five minutes later it slipped behind the Red Planet to begin what should have been its first orbit. Mission controllers at NASAs Jet Propulsion Laboratory in Pasadena, Calif., planned to regain communications with the craft at about 5:30 a.m. EST when it came around the other side. But instead, they heard nothing. Hours later, Mars Surveyor project manager Richard Cook said that a significant navigation error had occurred during Climate Orbiters approach to Mars. The original plan called for the spacecraft to pass about 90 miles above the surface during its closest approach. However, Cook said a review of the telemetry showed that on Sept. 22, the estimate of closest approach had slipped to 37.5 miles. That would be about 9 miles beneath the survivability level for the spacecraft, he said. The Mars Climate Orbiter launched Dec. 11, 1998, from Cape Canaveral Air Station.Artists concept of Mars Climate Orbiter103 as the next Shuttle flight was based on that progress.Missions ...(Continued from Page 1)STS-99 Managers also continue working toward a possible launch of Endeavour this year on mission STS-99, the Space Radar Topography Mission. However, according to the current status of wiring work on Endeavour, it is projected that it could be ready for a launch of STS-99 no earlier than December. Managers plan to continue to assess the progress of the wiring inspections and repairs on both orbiters weekly and to adjust target launch dates once the time required to complete the work is better understood.